Devon are all but through to the last eight of the MCCA Trophy after Liam Lewis's 101 not out helped the county to a nine-wicket win over Dorset. Josh Bess took 3-22 as Devon bowled Dorset out for 149 off 45.2 overs. Lewis hit fives sixes and eight fours from 91 balls, while Matthew Thompson scored 33 not out as Devon took 28.1 overs to win the game. 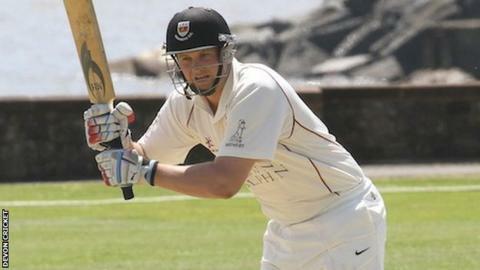 "Liam did brilliantly again," Devon director of cricket Keith Donohue told BBC Sport. "In the three games we've played, he's carried all the innings before him. He's in a rich vein of form." Devon will guarantee a place in the last eight if they beat Wales in their final group game next week. While Lewis stole the headlines, Donohue was keen to point out the work of the rest of the team in restricting Dorset to such a low total at Sidmouth. "It's always easy to point at an individual but it's a team effort," Donohue said. "The captain manoeuvred things in the field and the bowling unit grasped hold of the game. "It became much easier for the batsmen to feed off that confidence that we've gained in the field. "The last two games have been a big boost to our confidence, we've played pretty well."